As part of Le Creuset's Enamel-on-Steel collection, the superiorly crafted kettle features heavy-gauge steel construction for fast heating and even heat distribution, along with a hard, glossy enamel glaze for both durability and eye-catching beauty on the stovetop. The kettle's heat-resistant, ergonomic handle locks into place for easy lifting and pouring, ensures a secure grip and keeps hands a safe distance from the steam. 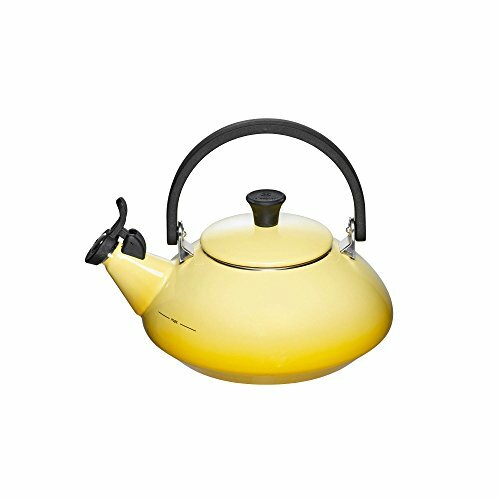 The loop-style handle comes securely attached to the kettle with stainless-steel brackets for added peace of mind. To refill the kettle, simply remove its round-shaped lid by pulling up on the stay-cool lid knob. The kettle can be safely used on all heat sources, including induction and should be hand washed only with hot soapy water and dried thoroughly.